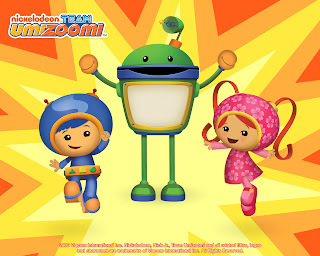 UmiZoomi has become my daughter's latest obsession. Have you guys seen this show? It's about a brother and sister team (Gio and Milli) and their robot friend (Bot). They go on these "adventures" and includes your child with solving their "missions". What I like about the show is that it teaches kids about shapes, patterns, and math. What I don't like about the show is that my DVR is completely over run with this show and my daughter watches them so much the theme song is ingrained in my head and will-not-stop. It's not uncommon in my house to literally blurt out -PATTERN POWEEER!! ........you'll get it. The show comes on weekdays on Nick Jr. I agree my kids love this show too. Yep, we get way too much of it at our house too. However, I'd like to thank you for posting a picture so I'd have something to look at to draw my daughters a picture of Milli. part of the reason Apple has introduced Continuity in iOS eight. — and then seamlessly continue it on your iPad.